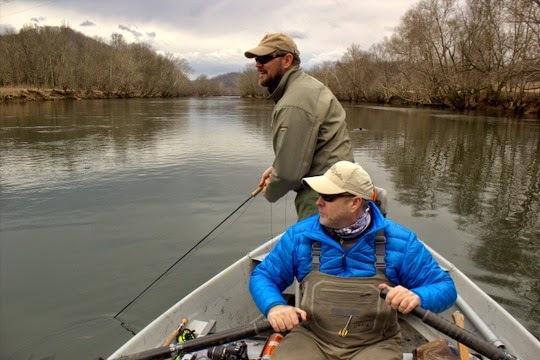 Anyone who knows me as a fisherman knows that I love stripping streamers for hungry trout and anything else that will hit, so naturally I wasn't about to turn down an invitation to float with David Perry of Southeastern Fly this past Sunday. With the heavy generation we have been experiencing, we decided that an early start was pointless and instead decided to enjoy a little extra sleep compared with most fishing trips. By the time we met up a little after 9:00 a.m., I was ready to hit the water hard. Early on, we tried a lot of different tricks. I had some eats on a dry/dropper rig I've been playing with, but lost the only fish I hooked. Before long, we knew that the generation was going to be dialed back and hopefully that would put the fish in a good eating mood. Sure enough, almost as soon as the water started to drop we started to see flashes and get a few hits. I had been on the oars for a while and by the time the water was falling out it was my turn to fish again. Somehow I got lucky and found myself in the front of the drifter. The view from the front is better than the view as the rower! I was experimenting further with some double streamer rigs that worked well my last time out stripping streamers. On this trip, everything came together, and I was really in the zone with follows every cast it seemed. The only thing that eluded me on this trip was the big one. 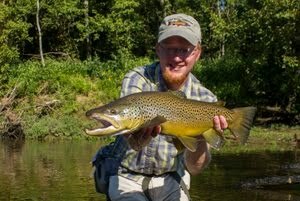 As far as numbers went, it was my best day on streamers in a long time. The big one did give me a chance, I should mention. Apparently it was not meant to be though. I got a great hookset as I watched one of the coolest boat-side eats I've seen in a long time. The fish jumped a couple of times as well. Everything seemed like it was working great. It just wasn't meant to be on this trip unfortunately. The good news is that I know where this fish lives, and even have a pretty good idea what he might like to eat. I'll be back looking for this fish and hopefully some that are much larger as well. The fish I did catch were all very healthy since virtually nobody has been out there harassing them. That means we can look for ward to a great year in 2015. 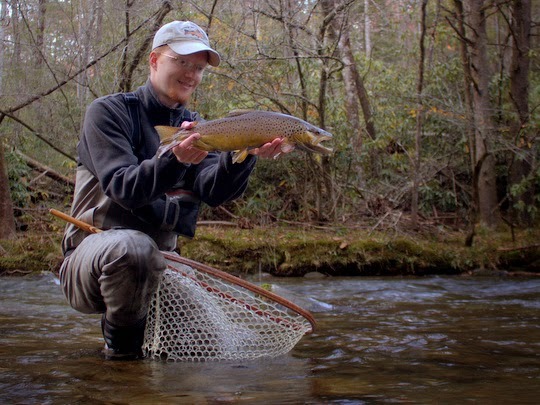 Looking ahead, we have some good flows finally on the horizon for streamer fishing. Next weekend it appears we will even have some low water to enjoy. Best of all? I currently have Sunday available for anyone wanting to get out and eliminate their cabin fever. The bad news? The weather on Sunday is calling for rain. Still, if you want to get out and fish, a half day float is not a bad idea right now if you are up for stripping streamers or maybe even some nymph fishing in the rain. Recently I have been doing some writing for Wide Open Spaces, and I wanted to share a couple of posts that I thought you would enjoy. Also, please help me spread the word around about these articles as it will benefit me and much thanks! The first article is one that I wrote near the beginning of the month. 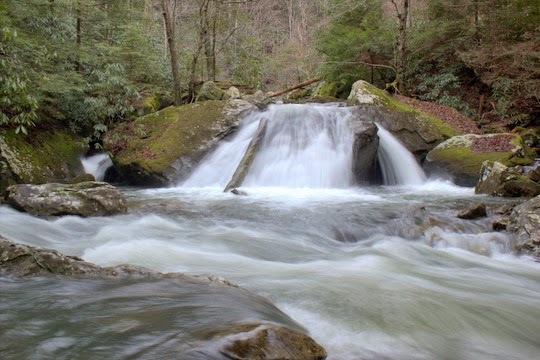 The article is the "Western US and Canada's 18 Best Trout Streams." Choosing the 18 best was difficult to say the least. Most of all, I was trying to write the article without choosing any secluded or secret water. In other words, I'm not in the business of outing secrets. If you have read this blog any length of time you may notice that I give a lot of generic fishing reports. That is on purpose of course. Another article just went live. I have been asking around for good fishing stories of people's craziest catches. There were so many great stories that I may have to do one or more follow up stories. 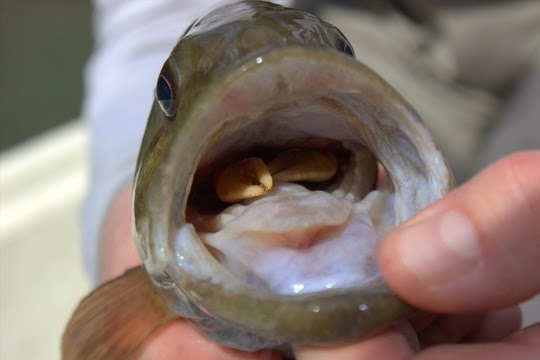 The story is the "10 Craziest Things You've Caught While Fishing." The last one I want to share is especially applicable now as we are all preparing for early spring. 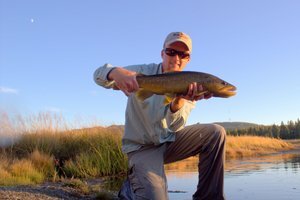 I chose a list of the "10 Flies to Use In Early Spring Fly Fishing." 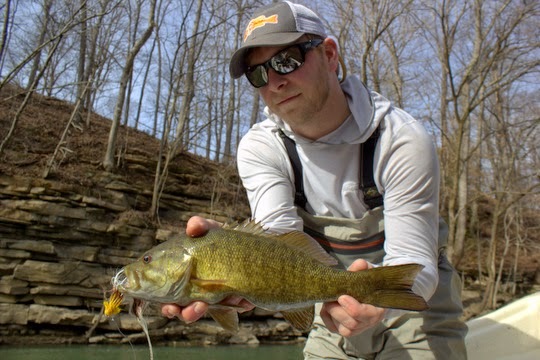 This article is not location specific, so the idea is that you should be able to find at least one fly on this list to be successful with in the early spring anywhere in the country. I'm particular interested in hearing your opinion on this article and the 18 best western trout streams article. Let me know below with a comment! Finally, check these stories out and support me by reading more that I have been working on for Wide Open Spaces. After tying a few flies, I'm all ready to go in the morning. I've only got a couple of trips in so far this year but ready to start hitting it a lot harder now. 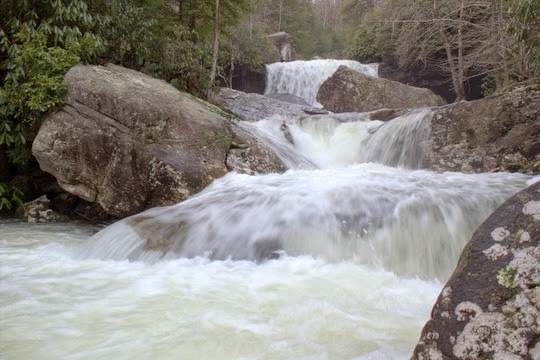 I'll be floating somewhere looking for some big trout and hopefully a shad kill. Check back in the next day or so as well as on Twitter and Facebook for updates to see if we had a successful trip! 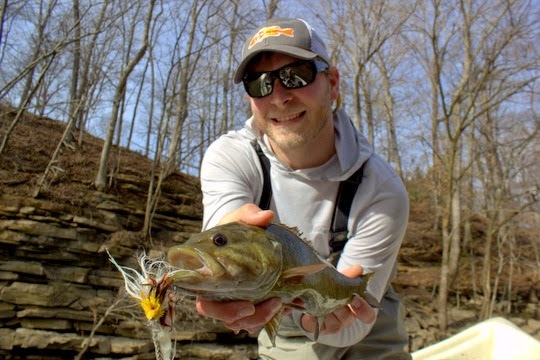 On Tuesday, I had the good fortune of getting out to chase musky and smallmouth bass and to just enjoy the warm weather we had for a few days. Dan Munger made it over to fish since it was his day off from Little River Outfitters. As always it was great having him in the boat. I also had my buddy Tyler who had not been on the boat yet. The goal was to chase some musky. Dan did well on his first musky float a few weeks ago and got that first musky out of the way so we were hoping for a repeat performance. Unfortunately the fish had other ideas and we just didn't see very many over the course of the day but then that's musky fishing for you. Of course, Tyler is not convinced that there aren't really such thing as musky in the rivers we fish so we'll have to take him again to show him some fish. he highlight of the day was when Dan had just cast to a nice rocky ledge. He barely started his retrieve before the heavy fly rod was bent under the weight of a nice fish. I thought for sure it was a nice musky, but he quickly announced it was a smallmouth. After a solid fight, we got the fish in the net and took some pictures. First, notice the size of the fly it hit! The fly was at least 6-7 inches long and perhaps more! 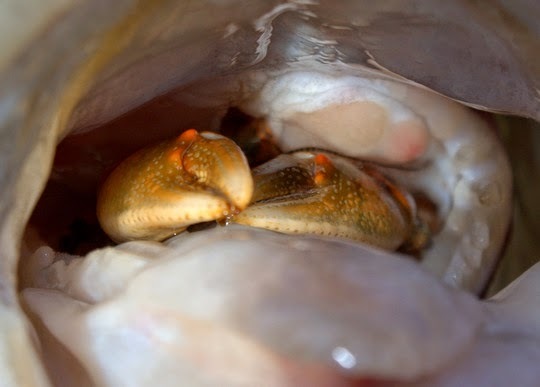 The best part though was that the fish had a large crawdad stuck in its throat. Talk about a greedy fish! It had a big meal and still wanted more. The rest of the float was uneventful except for the one musky that taunted us by rolling 10 feet off of the takeout ramp as we were approaching it. I guess we'll just have to get back out there sometime soon and try to even the score a little. As we took out the boat, the sunset alone made the whole trip worthwhile. What is the Craziest Thing You Have Caught While Fishing? Help me out! I am working on an article on the question above. What is the craziest thing you have caught while fishing? If you happen to have photographs that you would be willing for me to use, please let me know by emailing me at TroutZoneAnglers@gmail.com. This is for a freelance article I'm working on so only offer images if you are okay with them being used for that purpose (commercially). Thank you! 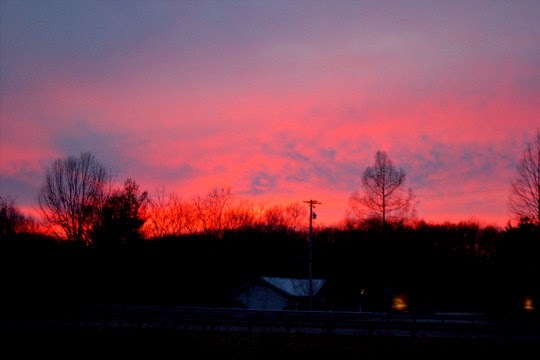 As far as I can tell, one of the chief disadvantages of winter is the early sunsets. 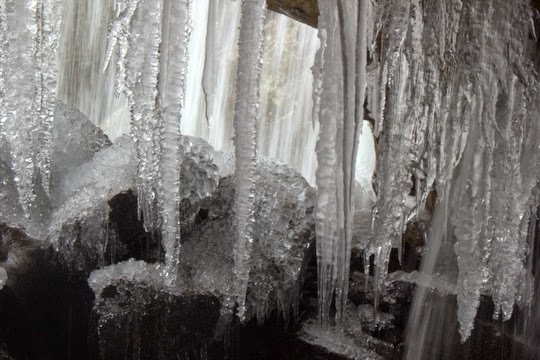 Cold weather is great as far as I'm concerned, and I enjoy ice and snow. 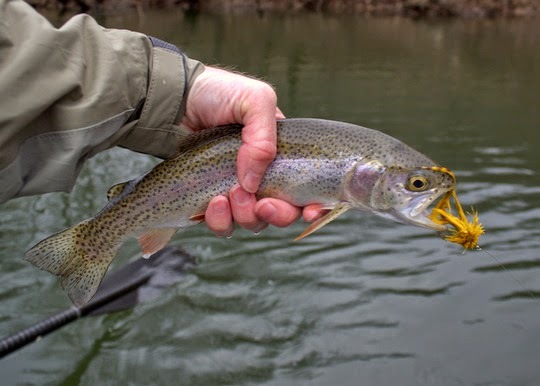 The weather tends to be gray and even drizzly more often which provides great fishing. Really, I cannot find too many things wrong with winter. I know that a lot of you will probably want to get on my case for my appreciation of winter and especially the cold weather and that's fine. I'm just glad that so many people dislike the cold months. The fewer people who get outside the more I can feel like I have it to myself. Selfishly, this is probably the main reason I like winter. The colder and nastier it is out the fewer people I have to compete with for fishing, and less people also means I am more likely to get uncluttered pictures. In the summer, especially in high traffic tourist areas like the Smokies, I have to often wait and wait and then wait some more for people to get out of my pictures. Winter brings a pleasant change of pace where I can pretty much show up, take my pictures, and then leave for the next spot. 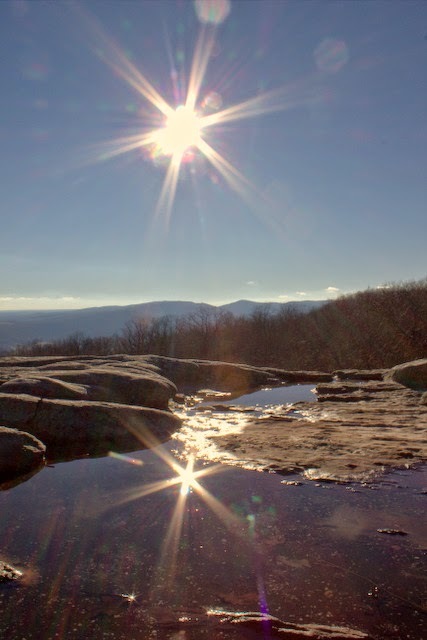 The one silver lining to the short days is that the sun is in the sweet spot for more time both in the morning and the afternoon. I'm talking about that time when the sun has sunk to just above the horizon or perhaps has just made its first appearance for the day. 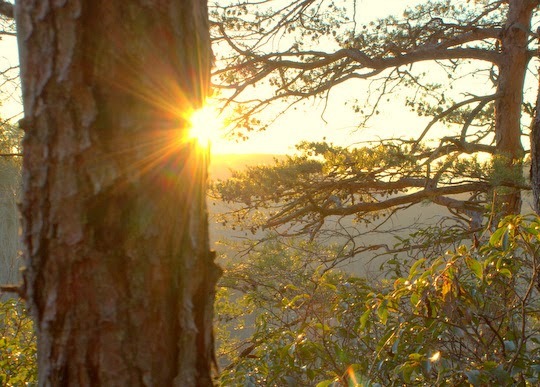 The golden hour of light is a photographers dream. In winter, that warm light lasts longer and seems even richer than normal. My obvious appreciation of winter may bias me here, but I think that the trajectory of the sun this time of year keeps it close to the horizon longer without actually sinking behind and out of sight. The result is some of the best sunsets you will find anywhere. If you want to see a great sunset, winter is one of the best times to do so. The air is usually clearer and cleaner so the colors are brighter. 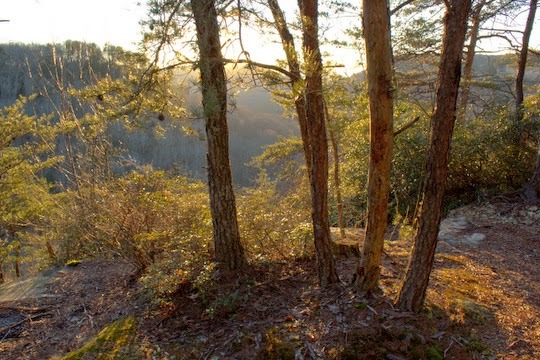 Landscapes bask in the glow of the late afternoon winter sun. 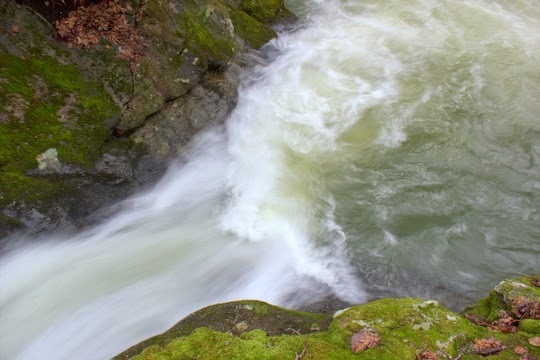 After being on the blink for several days, the Townsend Tennessee United States Geological Survey (USGS) streamflow gauge on Little River is back up and running. For those that would prefer to just show up and see what the river looks like, more power to you, but I prefer to maximize my fishing time by being on the water during prime conditions. 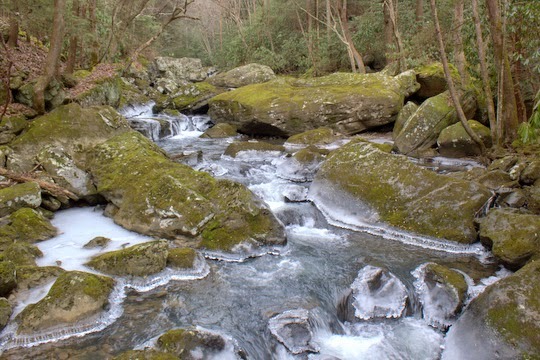 A couple of tips to help you out on Little River this time of year include watching both stream flow/level and the water temperatures. This is winter, and while the fishing will often be slower than in the summer, the fish still have to eat. That means that the general trend of the water temperature will be more important than the actual temperature. 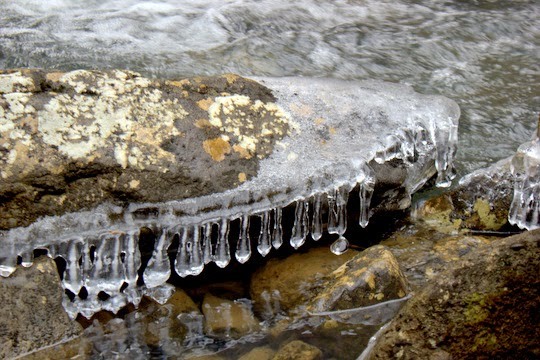 If the water has been 39 degrees or less for several days and then spikes up to 43 degrees, the fishing may be good. Those are the sorts of trends you should be watching for on the Townsend streamflow gauge. 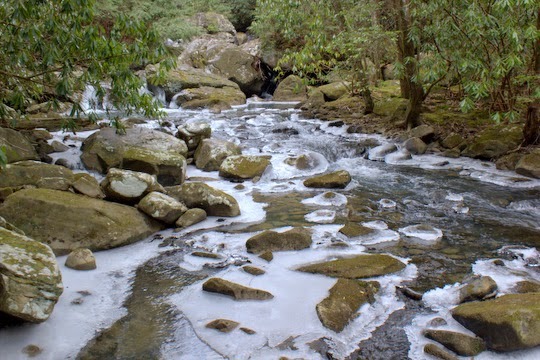 Also, a bump in stream flow this time of year will often correspond with rising water temperatures. Because of our proximity to the Gulf of Mexico, a lot of our cold season rain events are warmer than you might expect. Fifty degree rain works like magic in bringing up water temperatures and in turn gets the fish a lot more active. 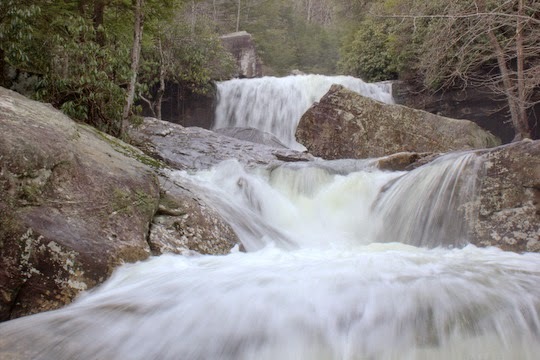 Start watching the streamflow on your favorite waters and you might be surprised at some of the correlations you discover with quality fishing. Fly tying seems to be peaking in interest right now, and I have good solid data to back me up on that. While perusing the Internet late this evening, I stumbled onto this interesting page called Google Trends that allows you to see what people have been searching for. 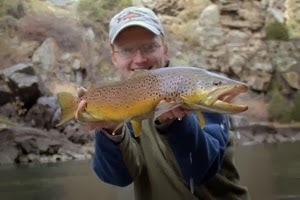 Intrigued, I started checking out trends on some fly fishing related topics. One of the more troubling results was that, as a whole, searches on the topic of fly fishing have been declining for almost 10 years. That likely signals a larger decline in people interested in fly fishing which is bad news for the industry. After getting a couple of obvious searches out of the way, I decided to type "fly tying" into the search box and see what happened. The graph looked suspicious and sure enough, upon investigation I confirmed that each peak in search activity corresponded neatly to the January/February time frame. Notice that we are recently headed for our seasonal peak in fly tying interest. If this graph does anything, it makes me realize that I'm not the only one stuck at home with cabin fever. For the past 2 weeks I keep telling myself that I'll go fishing sometime soon. Every day I seem to find an excuse to avoid it. I thought that the weather was going to finally break this week. Originally it looked like highs would be well into the mid and upper 40s which would allow for some decent fishing over in the Smokies. Unfortunately the reality turned out to be a little colder, enough so that we had a coating of ice on everything outside this morning. Freezing fog or drizzle or something like that according to the weather people. 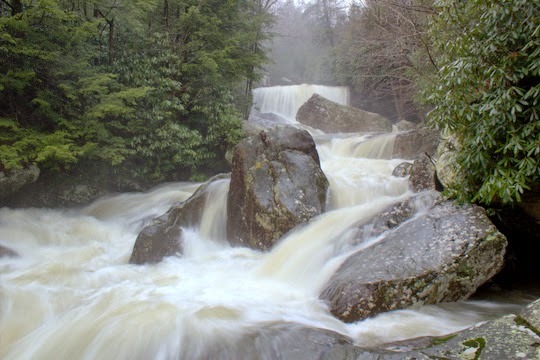 As has been the case for the last several months, we continue to receive a lot more rain than we probably need meaning I hike more than I fish now. The widespread moderate rainfall this past weekend caused the most recent in a long string of high water events. Here on the Cumberland Plateau, we have minimal soil. In some places, the underlying sandstone is completely exposed. All of this means that when it rains, there is not a lot of soil to soak up all that moisture and it runs off quickly. This last rain event was not as bad as the one in early December. Here is a picture from December 6. 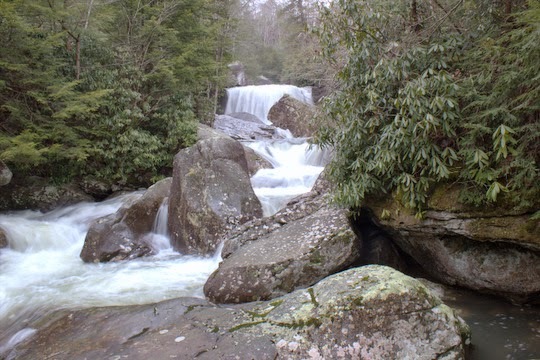 When I returned the other day, the water was definitely still high but I could safely maneuver up the rocks on the right side of the above picture for a better upstream shot this time. 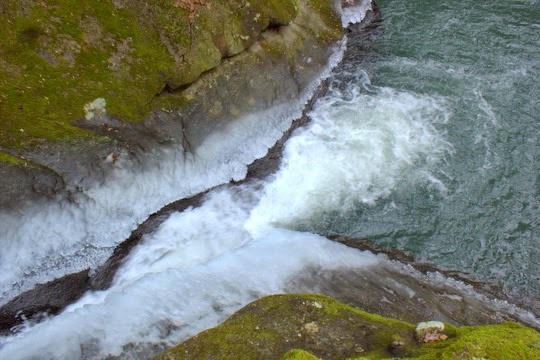 As you can see, it is full to the brim, but not as dangerous as the previous time I was there. Unfortunately, it was enough rain that I had to cancel a guide trip, something that is really tough to do financially this time of year. 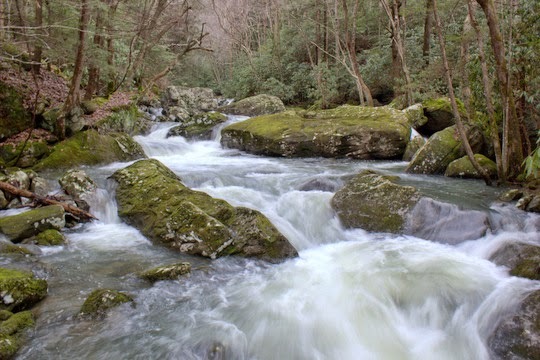 Safety is always a priority, however, and should be when dealing with the streams of the Smokies. Here are a few more shots from my trip on Saturday. I've been fortunate enough to get out in the woods several times over the last few days and intend to continue to do so as I work back into good backpacking shape for the spring fishing season! 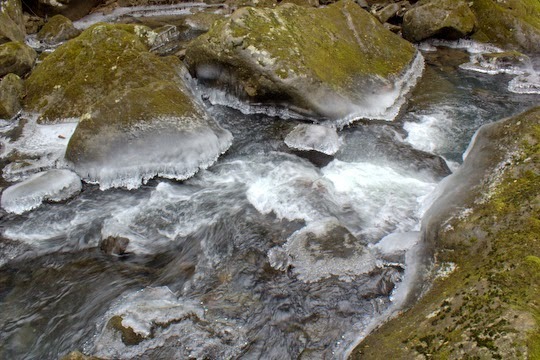 I still wish that this little stream was capable of holding trout. What a fantastic opportunity it would be for me and so close to home! Unfortunately, in the summer it gets very low and also too warm to support trout. 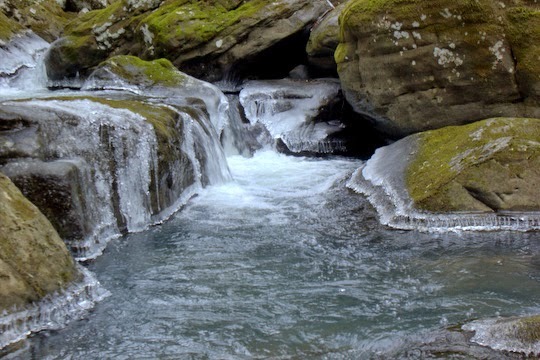 Check out more of my previous trips to this beautiful little stream. It just keeps producing incredible photo opportunities for me! 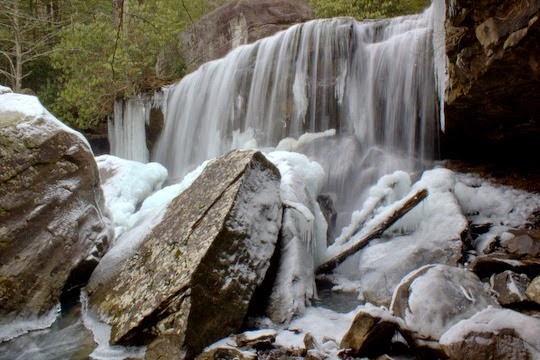 Here on the Cumberland Plateau, the recent storm system has moved out leaving us experiencing clear skies and cold temperatures. Hope for a shad kill is on the upswing with the cold snap dropping temperatures in area reservoirs. Each year we experience at least a small scale shad kill but in the best years it can bring the largest trout in the river out to feed. By Thursday, we are expecting lows down near zero so it won't take a whole lot of time at these temperatures to bring down water temperatures in the lakes. If we continue to have cold weather, I could see the shad kill here as early as the first of February although in some years it holds off until early March. Once it starts, no one knows how long it will last. Catching the first trout of 2015 was high on my list of things to accomplish yesterday, but it almost didn't happen. With minimal time available to devote to fishing, I had to stay fairly close to home. 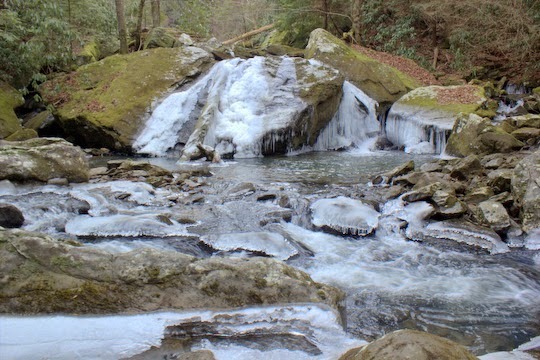 Even if I had made the drive to the Smokies, the very cold temperatures would not have been doing me any favors. 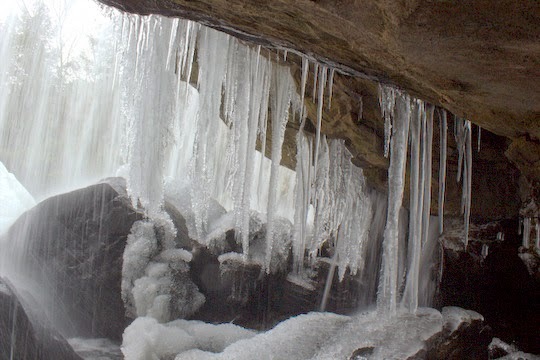 One of the winter stocking locations came to mind, and I started planning a quick trip. Since Cumberland Mountain State Park was not stocked this past December due to a lake drawdown, I had to find another place. 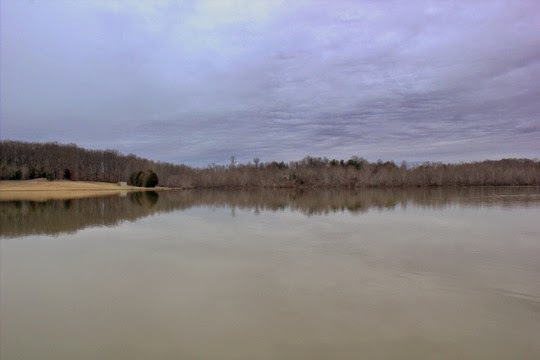 Cookeville has a place I enjoy fishing on occasion that also just happens to have some trout stocked in the winter so I headed that way. Arriving at the lake, I still had a rod rigged up from the other day and decided to just see what that would do. Pulling some line off the reel, I made my first cast of 2015. After letting the fly sit for a moment, I started a slow retrieve, stripping line in short 3-4 inch pulls. Before I had moved the fly very far the indicator went down, and I set the hook on the first trout of 2015. Seriously. First cast, first fish. Now, the question that I need answered is this: is it bad luck to catch a trout on the first cast of the year? Anyone who has fished long at all knows that catching a fish on the first cast of a fishing trip could be a bad sign. In fact, this particular trip highlighted this very problem. In a cold hour of fishing, I never had so much as another strike, much less a fish to hand. The somber skies matched my concerned mood. Bad fishing luck must be dealt with as quickly as possible so maybe I'll have to look into a new lucky fishing hat. The hot chocolate waiting in a thermos in my car helped to warm things back up. In fact, by the time I got home I was almost as warm as if I had not gone fishing to begin with. The question of luck continues to nag me though, so it looks like I'll have to do some first hand research into the subject by forcing myself to go fishing and see if my luck improves. I know, life is tough. Happy New Years to everyone! I hope you all have a fantastic 2015 and make this your best fly fishing year ever. My plan is to fish and travel more this year than ever before. What plans do you have? 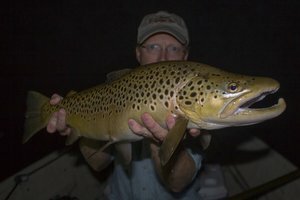 My birthday is long gone in the rearview mirror by now, but I'm still remembering a nice big brown trout I caught two days before my birthday. In fact, the picture of this fish was last month's Photo of the Month, but until now I have not told the the story of this trout. Each year, I have a birthday tradition that includes going fishing. It doesn't always fall on the exact day, but I always make sure to enjoy some time on the water and relax. Since I had to do some guiding a couple of days before my birthday, I decided to hang around at the end of the day and get some time in on the water. Choosing where to fish is always a challenge, but I was soon on a nice stretch of pocket water with a good pool at the top of the section. Working through the pocket water, I caught some nice rainbow trout on the same rig I had for my client. 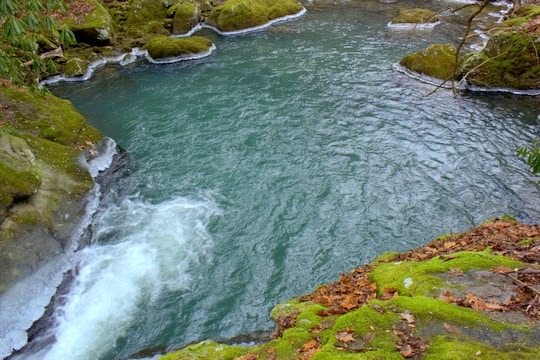 Arriving at the pool after slogging through some fast water below, I noticed a nice brown trout out feeding. Three casts with the nymphs produced one look but no eat, and I knew that to have any chance of catching that fish I would have to change flies. Searching for the right fly box, I realized with a sinking feeling that it had been left in the car. This was not the time to leave as I was in perfect position and moving again could spook the fish. I would have to make do with what I had on me. Finding a different box, I scrounged around for a good fly. Noticing a streamer I had tied more as a combination between a joke and an experiment, I shrugged my shoulders and decided to try it out. Fresh tippet came first and then the fly. Glancing up, I saw that the fish had moved and would require a few moments of rest before I started casting again. Finally, it slid back into its feeding position, and I started casting. The first cast was too far to the left, but the next cast was perfect. As the fly swung into view near the fish and I worked it with the tip of my rod, the fish charged over and inhaled the streamer. I set the hook and lurched to my feet from the cramped position on my knees. Immediate the fish made a run into the faster water below the pool, and I got nervous. Somewhat encouraged when I saw the fly firmly stuck in the corner of his jaw, I focused on easing the fish out of the heavier current and towards my waiting net. The moment of truth was anticlimactic as I got the net under the fish. Sitting down, I held the net under water so the fish could rest and breathe. After admiring it and taking a couple of pictures, I watched it depart quickly. Nothing could top that moment so I waded across the stream and headed back to my car. Some days, it only takes one fish and to ask for more would be greedy.